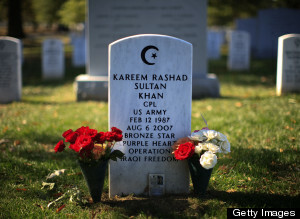 Interfaith activist and contributor to Huffington Post, Craig Considine, sheds light on some of the Muslim Americans who took part in protecting Americas as patriotic citizens and lovers of this nation: Honoring Muslim American Veterans on Memorial Day. In the piece Considine mentions more than three Muslims by name and goes back as far as George Washington time to cite historical evidence of Muslims assisting the American Revolution, refering to all as “great soldiers”. Considine’s article is exactly the type of accurate rhetoric that should be shared and circulated, by non-Muslims and Muslims alike, in this political atmosphere and in light of horrible crimes being committed and falsely attributed to Islamic teachings. Using the facts of history may be the best way to highlight the devotion and gratitude that American Muslims have toward the US and emphasis the values that America was built upon.